Yesterday, Dong Nguyen, creator of the bewildering smash hit Flappy Bird, announced via Twitter that he would be taking Flappy Bird down a day later. The tweet has, of course, fueled endless speculation over the past 24 hours - after all, why would the creator of a game that's apparently racking up $50,000 per day in ad revenue suddenly pull the plug? While we may never (and likely don't need to) know the true answer, one fact is evident - Flappy Bird has been taken offline. 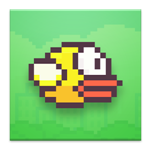 It's important to note that those who have already installed Flappy Bird can continue to infuriate (and perhaps, for a fleeting moment, gratify) themselves with the hopelessly beak-heavy pixel bird, but those who haven't already installed the game will be left out (unless they want to take a chance with the myriad knock-offs on the Play Store). If on the other hand you hate Flappy Bird, you can take out your frustration with the web-based Squishy Bird. The game's creator has given no evidence that the game will ever return, but does reassure Twitter followers "...I still make games."